Walkers is situated in the municipality of Murrysville, between Monroeville and Delmont, PA.
We are located on Route 22 East before School Road South, next to Cleveland Brothers (formerly Beckwith), directly across from the Eat ‘n Park restaurant in the Franklin Plaza. 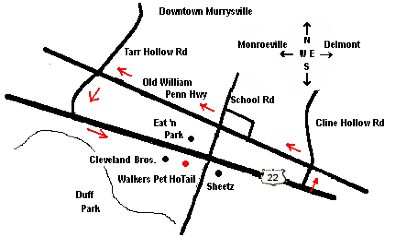 – If you are coming from the west (Monroeville or Exit 57 of the Pennsylvania Turnpike), take Route 22 East (Murrysville). We are approximately 5 miles from the Turnpike. When you get into Murrysville, there is a McDonalds on your left (we are 1.5 Miles from there). After about 1 mile, you will pass an 84 Lumber on your right. There will be a couple of more buildings before the next traffic light (at Tarr Hollow Road). We are the second driveway on the right after that light. If you get to the Walgreens or the Sheetz you’ve gone to far! – If you are coming from Route 22 West, make a right onto Cline Hollow Road, then make the first left onto Old William Penn Highway. At Tarr Hollow Road, make a left and then left again onto Route 22 East. Alternatively, if you pass the Sheetz on your left (at the stoplight at School Road and Rt. 22, make a right turn at the next light at Tarr Hollow Rd. and turn around in one of the parking lots back onto Tarr Hollow Rd. and make a left onto Rt. 22 East. Please refer to the map below. You may call us at 724-327-PAWS (7297) for any other directions you may need. If you would like to reach us by fax, our fax number is 724-327-0582.